Paper Size: 26" x 19.25"
The advent of the modern airliner began February 8, 1933, when Boeing delivered the first Model 247 to United Airlines. This all metal airliner, the first of its kind, could whisk its passengers in comfort at an astounding rate of three miles per minute. 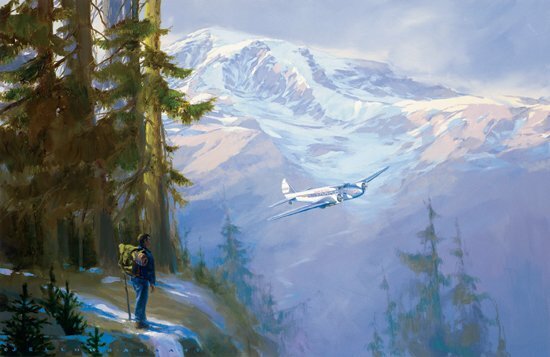 Seen here, this new Model 247, encounters a curious hiker as it drones its way through a pass in front of the south face of majestic Mt. Rainier. A fully restored example of this historic airliner resides at Seattle's Museum of Flight.